Having sort of a dilemma. 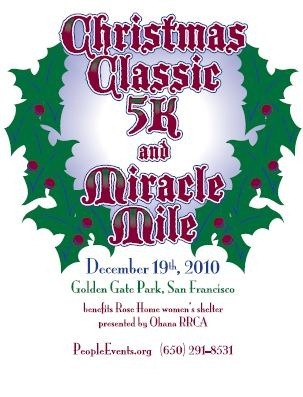 I’m supposed to be running the Christmas Classic 5K on Sunday morning in Golden Gate Park. Running this race would be difficult in the first place, given I haven’t been running much. That 5K distance is feeling mighty long lately. However, regardless of how much I’ve trained, I know I can always get through 3.1 miles. Maybe not as fast as I want to, but I can get through it. It’s supposed to rain on Sunday. 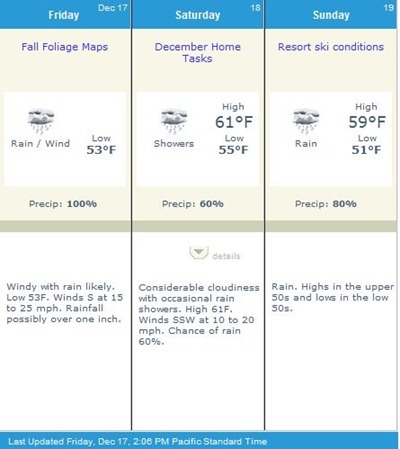 It’s actually supposed to rain everyday until December 26th. Maybe it’s supposed to rain after that too, but the weather channel only has a 10 day projection. Normally I wouldn’t mind running in the rain. I even stopped by the Sports Authority and picked up a Nike track jacket that was on sale, as well as a dri-fit cap to wear, so I’ll be dressed in a way to better fit the weather than I was when I ran “Run Wild for a Child” (which I will post about soon). 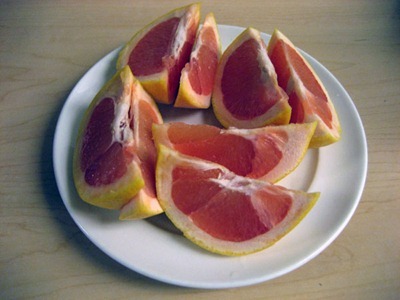 The problem is that for the last 4 days I’ve been teetering on the edge of illness. I had a horrible headache for both of my days off, then yesterday and today I’ve had a scratchy throat. I’ve been drinking lots of tea and other than these two symptoms, I’ve been feeling a-okay. I’m concerned, however, that if I go out an run 5K in a cold, windy storm, I will get a full blown cold or flu. Few things are worse than having a cold or flu during the holidays, so I’d like to refrain if possible. I guess I’ll just see if the scratchy throat goes away by Sunday and decide then. I’d really hate to waste my $25 though. Well, I mean, the money would still go to a good cause….but you know what I mean. Speaking of good causes, a couple of weeks ago I participated in Carrots ‘N’ Cake’s Holiday Bake Sale to raise money for the Leukemia and Lymphoma Society. 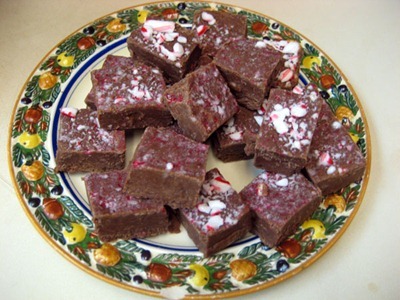 I was lucky enough to win an awesome batch of Peppermint Mocha Fudge! Tina sent me a HUGE batch of fudge…seriously, she sent twice as much as was on this plate! I put out this plate in the office kitchen (hence the plate with the chip…slim pickings for dishes in this place…) earlier and it’s almost half gone! People are digging it big time! In order to distract myself from all of the goodies in the office, I’m enjoying this beauty. Have you ever run a race in the rain? Was it horrible? I ran my half marathon in the rain. Cats and dogs, pouring down rain. And on the golden gate bridge as a matter of fact. Talk about a coincidence! Oh, I wouldn’t be worried about the rain at all except for my head cold. Though running in the rain won’t make you sick…if you’re already unwell, it’s probably not that great of an idea. That being said, I’ll probably run anyway….